Kristin Riebsomer is a staff attorney at Legal Aid Society of Greater Cincinnati. She is in her second year as an Ohio Legal Assistance Foundation Justice For All Fellow. Her fellowship focus is on assisting pregnant women address social obstacles that arise from living in poverty through M-HeLP, our medical-legal partnership with TriHealth. Q. Where are you from and where did you go to school? I’m originally from Brookeville, Indiana. I received my B.A. from Indiana University and my J.D. from Indiana University Maurer School of Law. I knew I wanted to pursue a second degree doing something where I could help people. I was applying to law school and a graduate program, and my application to law school came very natural so I knew that was my next step. During law school, I worked in the pro bono office in Bloomington on family law cases. It really sparked a passion in me for family law. Then during my 3L year, I talked with one of my professors about working at Legal Aid and he introduced me to Steve Sharpe, an alumnus of Mauer School of Law. After talking with Steve, I knew working at Legal Aid would be a perfect fit for me. My fellowship focuses on the social determinants of health and how they affect pregnant women a part of our maternal health-law partnership, M-HeLP. So far I’ve taken 51 M-HeLP cases helping women with family law and benefits issues. 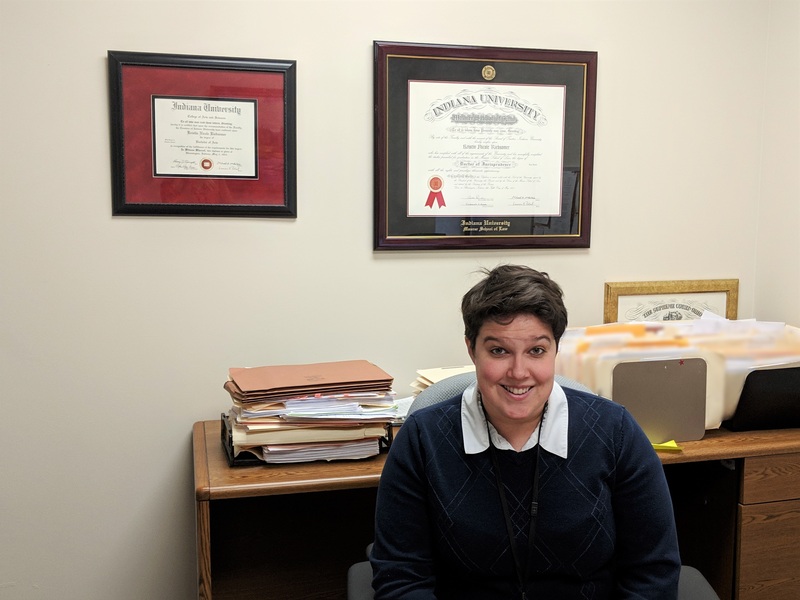 For my fellowship, it’s been really important for me to create working relationships with case workers at TriHealth to fully support the client in both the medical and legal aspect. I’m learning new things every single day. Every case I take is different in some way; I’m always researching and finding new ways to help clients. Q. Tell us about a memorable positive client outcomeI recently had a case where custody of a child was switching back and forth between the child’s mother and grandma, due to the mother’s drug addiction problems. After many issues arising and this child being in unstable housing and family situations, I successfully got the grandma full custody of her granddaughter. This case carried on for a long time so I was very happy once we got the child in a stable custody situation. How do you relax/unwind?I enjoy walking my dog and going on hikes. I’m in a competitive karaoke league with my husband. I also belong to a boxing gym which I try to go to multiple times a week. On Saturdays I volunteer at the SPCA walking dogs. I’ve always been a big animal lover so I really enjoy spending time with these dogs that don’t have homes. I live in downtown Cincinnati. I was a commuter student through law school so I really wanted to live somewhere where I wouldn’t have a commute. I also like living downtown because there are always new restaurants and shops to check out. I’ve been most surprised about the supportive nature of everyone here. No matter how many questions I have about a case, my supervising attorneys really treat it as a team effort and help in any way they can. M-HeLP is funded by a multi-year grant from bi3, a major funder of health care transformation and co-sponsor of TriHealth, and is supported by Legal Aid, TriHealth, and Cincinnati Children’s Hospital.